In April 2017, as the battle for control of Mosul raged between Isis soldiers and the Iraqi army, a team of rescuers pulled off an unlikely escape for two of the city’s animal residents. Simba the lion and Lulu the bear were the last surviving inhabitants of Al-Morour Zoo, which had fallen into neglect since fighting had intensified in October 2016. 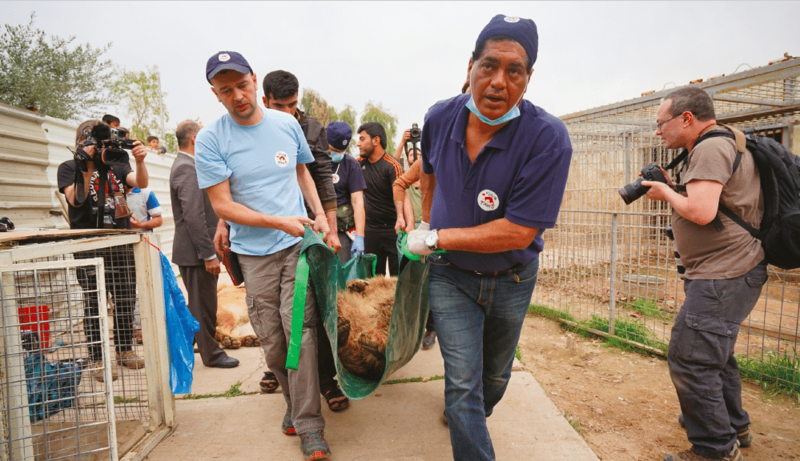 As this video from animal charity Four Paws shows, getting two large carnivores out of a conflict zone was an exercise fraught with danger, setbacks and frustration. For the full story of how the Four Paws team, led by fearless field vet Dr Amir Khalil, conducted the incredible extraction operation, see our report in issue #27 of Delayed Gratification, available now from our online shop. This entry was posted on Wednesday, September 27th, 2017 at 11:10 am and is filed under From the team, Video.